Photo credit: “26 Raimbilli Cousins” (1980-1994), mixed mediums on cardboard, by Gayleen Aiken, at the Luise Ross booth at 548 West 22nd Street. The Outsider Art Fair, a wonderfully eccentric jewel in the crown of New York art fairs, has a renewed radiance. For the first time in its 20-year history, it occupies a building retrofitted for art: the clean, well-lighted spaces of the former Dia Art Foundation. This places it in the western reaches of Chelsea, once again confronting the world of contemporary insider art with irrefutable proof that the most lasting work comes from unstoppable emotional necessity, an especially useful lesson for the moment. Since its inception, the fair has been pivotal in establishing the importance and richness of 20th-, and now 21st-century, folk, outsider and self-taught art and for virtually introducing greats like James Castle, Morton Bartlett, George Widener and others to the public. But it has had some ups and downs. Founded by Sanford Smith in 1993, it was first held on the ground floor of the venerable Puck Building on Houston Street, close by SoHo, then still heavy with art galleries. The Puck’s quirky, irregular spaces seemed made for the oddities of outsider art, but in 2008 the building became unavailable. For the next five years, the fair was held on — or exiled to — an upper floor of a generic office building on 34th Street, where it did not flourish. Last year the 34th Street space shut down, and Andrew Edlin, an art dealer and fair participant since 2004, urged Mr. Smith to move the fair to Chelsea. Shortly thereafter Mr. Edlin offered to buy it, and a deal was struck. With Mr. Smith staying on as a consultant, some new exhibitors were attracted, and others weeded out. Voilà: the 2013 Outsider Art Fair, transformed. This year’s fair offers a dizzying array of outstanding things to see and some impressive new names. Established artists — Bill Traylor, Martín Ramírez, Adolf Wölfli, Joseph Yoakum, John Kane, Sister Gertrude Morgan, Sam Doyle and Mr. Widener — dominate the booths of Ricco/Maresca, Dean Jensen, St. Etienne and Carl Hammer, which also has five canes with expressively carved and inlaid handles made by an artist known only as Stick Dog Bob for members of a Black Power group in Chicago during the 1960s. St. Etienne has papered the upper tiers of its walls with a fascinating timeline about the emergence of outsider art and self-taught art and their European counterpart, Art Brut. Du Marche, a newcomer from Lausanne, Switzerland, has devoted most of its space to Alöise Corbaz (1886-1964), the great Swiss outsider, known for her nearly fluorescent colors and voluptuous figures. You can immerse yourself in the art of Haiti, Jamaica and other Caribbean locales at Pan American Art Projects, Bonheur and Bourbon-Lally, where bright sequined voodoo banners are piled high on tables. It adds to the show’s clarity that nearly a quarter of the booths feature just one artist. Gary Snyder is surveying the work of the painter Janet Sobel (1894-1968), who worked in several modes of peasant-art-flavored figuration and also made dripped abstractions before Jackson Pollock. 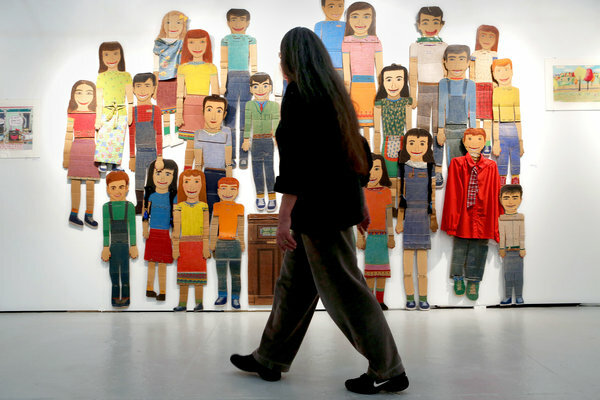 Luise Ross has the colorful, carefully captioned crayon drawings of Gayleen Aiken (1934-2005), a Vermont outsider, and a cluster of 26 nearly life-size bucktoothed people in painted cutout cardboard called the Raimbilli Cousins, that Aiken made to keep her company. Kinz-Tillou has devoted its space to the work of Winfred Rembert, a self-taught artist born in 1945, who creates vivid family portraits and scenes of chain gangs working in cotton fields by applying dye to large sheets of carved and tooled leather. C. Grimaldis, a Baltimore dealer, has returned for the third year with the wonderful paintings of Giorgos Rigas, 92, whose populous scenes of life in the Greek mountain village of his childhood are every bit as good as Grandma Moses’ work. As before, the fair suggests that the line between outsider and insider art becomes blurrier with each passing year. At Ames you can marvel at the exquisite, dreamlike collage drawings of Deborah Barrett, which suggest a blend of Jim Nutt and Lynda Barry, as well as the more naïve renderings, mostly of people in urban settings, by Esther Hamerman (1886-1977). At Mr. Edlin’s booth the self-taught wizard Brent Green, known in the regular art world for stop-action animations and installation works of a Southern Gothic ambience, contributes a loose-limbed hanging sculpture in carved and painted wood: “Angel With Listening Machine.” Laura Steward, a new participant from Santa Fe, N.M., is displaying numerous round and square coins made of silver or melted pennies, by Thomas Ashcraft, a self-taught astronomer, for use in other realities. Also here, a life-size woman fashioned from coyote skin turned inside out (or not, when hair is needed) by Erika Wanenmacher, a practicing witch who claims that it is a spell. At the same time the fair also gives glimpses of just how limitless the outsider realm remains. Several little-known or virtually unknown artists make very strong impressions, none more so than Renaldo Kuhler, 81, presented in a special exhibition, whose dense drawings portray an imagined world, Rocaterrania, complete with its own alphabet. At Henry Boxer, note the delicate reimaginings of Cambridge University drawn by John Devlin, a Canadian artist, who had a nervous breakdown there as a young divinity student, and the hybrid creatures, rendered in chain-mail patterns of ballpoint pen by Mehrdad Rashidi, an Iranian artist living in Europe. At Cavin-Morris the intricate drawings of M’onma, a Japanese man in his 60s, consist of layers of gossamer images that resemble ghostly tattoos and must be among the gentlest expressions of the horror vacui ever made. Don’t miss the amazing hand-built pots, decorated with sinuous reliefs of animals and figures, by Georgia Blizzard (1919-2002), at Tanner-Hill. Two new wood carvers stand out: John Byam, a maker of small but rough everyday objects and weapons sprinkled with sawdust at Edlin; and, at Lindsay, Stephen Sabo (1903-2002), who made variously painted miniature tableaus, reliefs and individual sculptures of animals and birds. Chris Byrne, a newcomer from Dallas, is presenting the spookily realistic heads of Frank Bender (1941-2011), a self-taught forensic sculptor who helped solve cold-case crimes by intuiting how perpetrators and disappeared victims alike might look years later. The heads are displayed with relevant news clippings. What else? Plenty. The works by Japanese outsiders at Yukiko Koide Presents include the entrancing abstract drawings of Eiichi Shibata, an autistic artist inspired by soap and bubbles. At Institute 193, a nonprofit gallery and publisher from Lexington, Ky., notice should be taken of the pieced-together panoramic photographs of Albert Moser, the tumultuous ballpoint pen drawings of Beverly Baker, and much else. There are the displays brought by dealers of contemporary art who handle outsider material in a limited way: at Vito Schnabel, the eerie paintings of candles on old windows by Vahakn Arslanian; at Feature, the calligraphylike drawings of the Kowa people of central India, who have no written language; and at Laurel Gitlen and Sorry We’re Closed (a Brussels gallery), the latest drawings from Michael Patterson-Carver, depicting extremely orderly protests with people carrying signs. This fair has rarely made a better case for itself, for the field of artistic activity whose depth it only hints at and for the increasing futility of cordoning off that field from the rest of today’s art. The Outsider Art Fair continues through Sunday at 548 West 22nd Street, Chelsea; (212) 337-3338, outsiderartfair.com. A version of this review appeared in print on February 1, 2013, on page C23 of the New York edition with the headline: Feeling Right at Home on the Fringe.